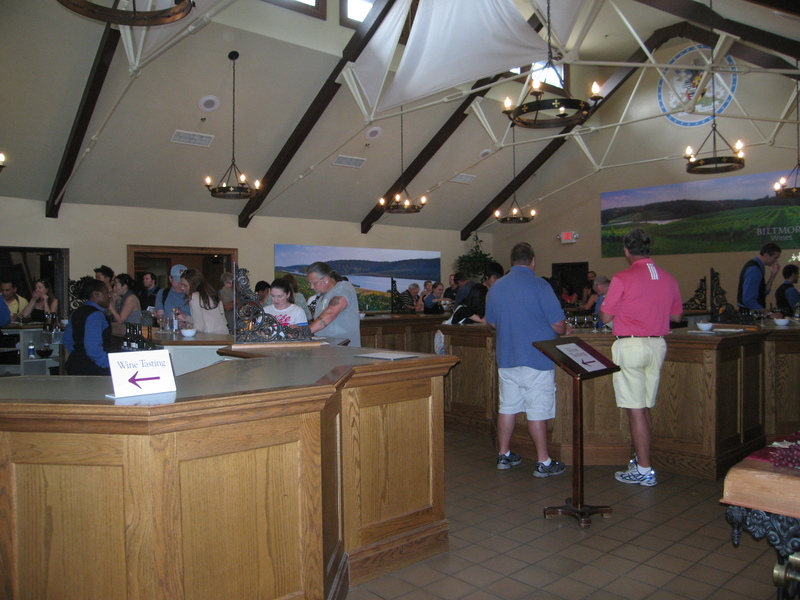 Included in our Biltmore Estate admission was a free tasting at the Biltmore Winery. I knew Biltmore had a winery, but they don’t have distribution on the West Coast, so I had never had any of their wines before, and I wasn’t quite sure what to expect… On walking into the winery, you are immediately struck by how big it is. There are at least 6 islands, with tasting space for at least 20 people at each island. Wow! It wasn’t super busy, and we were led over to an island with about 8 other people. The interesting thing about the Biltmore tasting is that you can taste everything if you want. And it is no small selection – they have 24 wines on their complimentary tasting menu! I figured that since I wasn’t driving, I would take them up on the offer! The Tasting Room building used to be the estate’s dairy barn. The wooden beams on the ceiling and the steel cross bars are leftover from the dairy days – I don’t know why they decorated the steel structure with white banners, I think it looks weird. I think that they should have tried to retain more of the original dairy barn features, because you would never guess that it was a dairy barn when you walk into the building now. Sauvignon Blanc – This wine was very floral, like a Viognier, with a grassy flavor. Not my favorite. Reserve Chardonnay 2009 North Carolina – Very buttery. I prefer a crisper stainless aged Chardonnay, but Jon liked this one. Chardonnay Sur Lies – the server explained that Sur Lie means that the yeast settles on top for a couple of months, like beer. This wine was light, with a hint of carbonation. Interesting, but not a knockout wine. Pinot Grigio – This one had a honeysuckle nose, with a light citrus flavor, a slight tartness and a hint of honey. Pretty decent! Riesling – This wine was honey sweet and syrupy, with not crispness at all. I was not a fan. Century White – I didn’t try this one. Chenin Blanc – This wine was sweet with a slight syrupy feel. It tasted of pineapple and honey. It was decent, but I like my Chenin Blanc more on the crisp side. Limited Release Chenin Blanc – Our server told me that this wine was sweeter than the regular Chenin Blanc, but I found it to be less sweet. It has more of a tropical fruit taste, without the honey of the regular Chenin Blanc. I liked this one quite a bit! House White – This wine was very floral, and sweet at the same time. An interesting combination. Our server told us that it is a blend with Malvasia, which is a sweet white. I hadn’t heard of Malvasia grape before – it originated in the Mediterranean and is typically used in white blends, sweet wines, and some dessert and fortified wines. I didn’t love the Biltmore House White, but I’ll have to keep an eye out for this grape in the future. Century Rosé – This is a blend of Sauvignon Blanc, Gewürztraminer, and Grenache. This wine has a very light taste of strawberry. It was good, but almost didn’t taste like a wine – more like a fruit juice. Cabernet Sauvignon Blanc de Noir – This wine was a light melon flavor. It was very enjoyable! Zinfandel Blanc de Noir – This wine was very good, with raspberry and tropical fruit. It was sweet, and I imagine it would be a wonderful summer wine with chocolate! 2012 Festival of Flowers Rose – This wine was sold out, so we didn’t get to try it. The name implies it is a floral wine, which I’m not a bit fan of, but the description said it is sweet and fruity. I guess I’ll never know. Pinot Noir – This Pinot was very light and seemed watered down and lacked much flavor. It was pretty disappointing. Cardinal’s Crest – This wine was a blend of the kitchen sink – Cabernet Sauvignon, Cabernet Franc, Syrah, Merlot, Pinot Noir, Sangiovese and Grenache, but it works! It has a taste of blackberry with light oak. It is fairly tart, it needs to age just a bit to settle some. It would be a great wine with a meal, the perfect spaghetti wine! Merlot – I didn’t try this one. Sangiovese – This wine smelled strongly of smoke, and had a berry and plum flavor. It was ok, but not spectacular. Century Red – This wine is a blend of Sangiovese and Merlot. Jon didn’t like this wine, but I did. It has the taste of plum and vanilla and smoke on the nose. Syrah – I didn’t try this one. Zinfandel – This wine has a lot of berry taste and tart acidity with a light mouth feel. The tasting notes described it as having tobacco and caramel aromas, which I did not get from it though. It was decent, but not great. Limited Release Merlot – This wine was very bitter on the back of the throat. It was heavily oaked, and I didn’t like it at all. Cabernet Sauvignon – Jon didn’t like this one, which was odd as he typically likes Cabs best. I thought it was nice, as it was not very oaked. House Red – I didn’t try this one either. 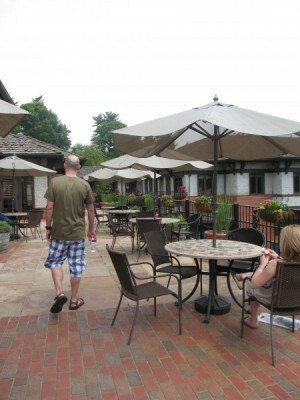 The winery has some premium wines that you can taste for a fee, but we decided not to. Maybe if the complimentary wines had been a bit more impressive… All in all, I thought that the Biltmore wines were very drinkable, but not great wines. I liked the Rosés the best, perhaps because a Rosé is supposed to be a light, refreshing summer wine, and it doesn’t need the structure to age. It seems that Biltmore still has a way to go in order to get to where many of the Oregon, California and Washington wines are. And that’s ok, since wine tasting wasn’t the focus of this trip. And we had plenty of historic sites still to come! The Biltmore wines are all reasonably priced, so I did walk away with 3 bottles – my favorites from the tasting. As we were only on the second day of our trip, I knew we would have an opportunity to drink them before we got back on the plane to come home… I bought the Limited Release Chenin Blanc, the Zinfandel Blanc de Noir, and the Cardinal’s Crest. We brought home a couple of their logo glasses too, to remember the trip long after those bottles were gone.